I first heard of the Instant Pot a few years back when I read a poll about people’s favorite slow cookers. Rather than seeing a traditional slow cooker take the lead, I was surprised to see all the praise heaped on the Instant Pot. I’d never even heard of an Instant Pot before. Of course, these days you can’t open up a cooking website or magazine without hearing about them. 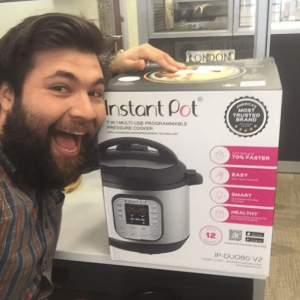 A few months after that initial introduction, I bought and reviewed my first Instant Pot. I was excited and curious about it but went into it with a healthy amount of disbelief and skepticism. After all, is it possible for one appliance to do the job of seven? After using it for myself, I decided to write a quick follow-up report. Here are my thoughts on the Instant Pot after using it for eight months. Instant Pot and Pressure Cooker are basically one and the same. When we tested the Instant Pot 7-in-1 Duo, it was found to be easy to operate, extremely durable, very affordable, and creates tasty meals. There is no other pressure cooker that we know of which comes with 4 accessories that are safe to use in dishwashers. And because the Instant Pot is made of stainless steel, it is durable and easy to clean. The device can hold 6 quarts of food, which is enough to feed about 6 people. If you’re part of a busy family, then this pressure cooker is perfect. It won’t cost you much money either. As we tested the Duo’s ability to cook rice in comparison to other pressure cookers, we discovered that it ranked 3rd in the longest time to prepare it. Fortunately, the grains were fully cooked without sticking to the pot at all. When we cooked the pot roast with the Duo, it also took some time, but the roast turned out quite tender. In fact, the beef broke apart in people’s mouths in many cases. When it came time to clean the pot, it was more stick-resistant than any other pot we tested. There are different sizes of the Instant Pot 7-in-1 Duo available. The standard size choices are 8 quarts and 6 quarts. However, if you plan on cooking for fewer people, then you can also choose smaller models which hold 5 quarts or 3 quarts. There are no bigger sizes available from this brand. The Duo model includes 8 food buttons which are pre-set for cooking certain food items like soup/broth, bean/chili, meat/stew, rice, poultry, porridge, yogurt, and multigrain. Other cooking options include sautéing, slow cooking, steaming, and pressure cooking. With this kind of versatility, you can do all kinds of cooking. This pressure cooker is fabulous for people who prefer to plan meals ahead of time. There is a delay start button that lets you put food inside the cooker and then schedule it to start cooking within 24 hours from that point. Once the food is cooked, you can use the keep warm button to prevent the cooked food from going cold as you wait until you’re ready to eat. Most areas of this versatile pressure cooker remain cool if you try touching them. However, these devices are always going to be hot near the condensation cup, lid, and release valve. Out of all the brands we’ve reviewed, the Instant Pot Duo was the only one to have an app of its own to track and share various food recipes. As for the recipe book, it was very helpful and contained a lot of useful information, such as the cooking times for certain foods which do not have their own food buttons built into the device. That way, you can just look at your app if you need to know how long to cook certain foods. Plus, no other pressure cooker device has utensils which are safe to wash in the dishwasher. Things like the rice spoon, ladle, steamer rack, and measuring cup can all be washed safely in the dishwasher. Just put them on the upper rack of the machine and let it do the rest. The Instant Pot Duo is made from stainless steel. This makes it extra durable to the point where it won’t get stained or scratched from using it. And if you’re still worried about it getting damaged or malfunctioning, you get a 1-year warranty included with your purchase of the Instant Pot. If 1 year is not enough time, then try the Black & Decker brand instead. The Instant Pot operates under safe conditions because it does not start until you properly install the lid. From there, the lid stays locked and cannot be removed until the pressure within the pot is fully released. To add even more safety, the machine is built with a unique fuse that shuts off the cooker automatically if the temperature levels get excessively high. Interior is Stainless-Steel – The Instant Pot is one of the few electric pressure cookers to have an interior made completely of stainless-steel. Even though you may see other materials like plastic on the exterior of the pot, these materials do not touch the food at all. Only the stainless-steel interior touches the food. You won’t find a non-stick surface or Teflon surface either. Multiple Uses – Since the Instant Pot can be used for multiple purposes, it can replace other appliances in your kitchen like the sauté pan, steamer, rice cooker, and slow-cooker. Many people have claimed that they use the Instant Pot more than their traditional oven and stove. Slow Cooker Replacement – The Instant Pot is a suitable replacement for the slow-cooker and Crock-pot because it works so much faster and gives you better results. If you have a small kitchen, the Instant Pot is a very convenient electric pressure cooker to add to it. You can use it to replace so many other appliances that take up space. Save Time – One of the biggest advantages to using the Instant Pot is the amount of time it saves you. For instance, there are some recipes in which you’re supposed to use a slow-cooker to prepare. These would usually take between 6 to 8 hours to finish cooking. But with the Instant Pot, you can prepare these recipes within 1 hour. You can even cook a dinner roast in just under 40 minutes. If you’re somebody who works during the day and would like to prepare a good meal quickly when they get home at night, then the Instant Pot can be a lifesaver. Cost Effective – The Instant Pot’s price tag may seem higher than the price tag of a rice-cooker or slow-cooker, but that’s because the Instant Pot is a combination of all those other cookers. It may cost more upfront to purchase the Instant Pot, but at least you won’t need to purchase any of those other kitchen appliances. This makes it a very cost-effective purchase. Programmable – Regular slow-cookers and pressure cookers are not programmable. What makes the Instant Pot so much better is that it is programmable. You can put food in the Instant Pot and then schedule a time for it to cook. You can program the pot to start cooking within a 24-hour period. There are several pre-programmed options available to choose from. Energy Efficiency – The Instant Pot uses electricity as its heat source. You don’t need a separate electric stove or gas stove to use this pot. It produces the electricity on its own by simply plugging into an outlet. It regulates itself and is safe and easy to use. Cleaning is Simple – The stainless-steel interior makes it easy and simple to clean away food particles and debris. You can clean it in the dishwasher or by hand. 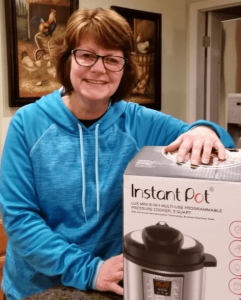 The Price – As previously stated, the price of the Instant Pot is fair when you consider how it can replace many other appliances in the kitchen. The retail price of the Instant Pot is more than $200, but I was able to purchase mine for $100 with a 50% off discount. Of course, I had previously purchased those other kitchen appliances before I ever knew about the Instant Pot. If I had known about it first, then I could have saved even more money by not purchasing those appliances. Learning Curve – Pressure cookers have always scared me because I once had a relative whose face was burned after an accident occurred with her pressure cooker. On the upside, the Instant Pot is much more user-friendly than traditional pressure cookers. But if you’ve never used an Instant Pot before, then you need to get past the learning curve first. After a few uses, you should be okay with it. But just to be safe, you should read the instruction manual prior to using the Instant Pot. It is a short read that is filled with important user information. 1)What Is the IP DUO60? The Instant Pot is a multi-use cooker that can work as a slow cooker, rice cooker, electric pressure cooker, yogurt maker, steamer, sauté/browning pan, and even a warming pot. This single appliance can do the job of around seven different appliances and tools. That sounds impressive, no? I don’t know about you guys, but I can say I don’t have the storage space for seven different appliances. To be frank, I initially thought there was no way the Instant Pot could deliver on those promises. I was preparing for the device to malfunction, if not stop working outright, pretty quickly. I felt it was just a matter of time before it happened. As I looked through the instruction manual and started setting the Instant Pot to task, something happened I would never have expected; the more that I used the Instant Pot, the more I enjoyed actively using it. I finally stopped expecting the worst to happen and started to rely on the device for cooking my weekly staples such as lentils, dried beans, brown rice, and hard-boiled eggs. I primarily use my Instant Pot as a slow cooker and pressure cooker. I’ll sometimes use it the pot to warm or sauté food, depending on the recipe, and every so often I’ll use it as a rice cooker. Those are the functions that fit into my lifestyle best and are the foods I make on a regular basis. The Instant Pot can also be used for making yogurt, but I’ve not tried that function for myself yet. This one handy appliance has made cooking much faster and more convenient. Even my husband has been using it lately! I love being able to cook steel-cut oats and have them for breakfast in a fraction of the time I’d need to cook them on a stove, make rice in minutes for a quick stir-fry, or slow-cook stews. It’s even replaced my slow cooker, which has now been taken out of the kitchen. There came the point during the eight months where, without even realizing it was happening, I fell in love with the Instant Pot. I went from being skeptical about it to understand why and how it gets so much praise, and I’ve found myself feeling that way about it too. The Instant Pot is a highly versatile and well-performing appliance. Just about everyone who purchases the Instant Pot DUO60 programmable pressure cooker is satisfied with their purchase. They find themselves wondering how they ever dealt without it, mentioning how it was able to perfectly cook meat, vegetables, risotto, and other foods quickly and efficiently. Many people say that the Instant Pot works as a great rice cooker and slow cooker, as well as a pressure cooker. Testing of the device would appear to back up those claims. The editors at Good Housekeeping did their roundup of the device, saying that it was the only electric pressure cooker they had seen that prepared rice, as well as a dedicated rice cooker, did. They added it aced the usual slow cooker tests they have. It was able to perform just as well under offering great results for everything from sautéing to slow cooking. The testing at Reviews.com found similar results, saying the Instant Pot DUO60 offered perfectly cooked meals no matter the setting. Consumer Reports, testing the appliance to see if it could do the job of seven appliances, found that there was just one time a dedicated appliance was able to do a better job. That was steaming. Most owners are thrilled to bits with the yogurt making feature, which they say is worth the price of investment alone. There is a small learning curve to the Instant Pot DUO60. During testing with Wirecutter, Lesley Stockholm found the Instant Pot looks complex, but it’s really easy to figure out. Many people agree, but they do make a note of a poor instruction book that doesn’t offer much helpful information. However, the Instant Pot has proven so popular that there’s an almost endless amount of online resources where users can download instructions and recipes, including instructional videos that provide a visual walkthrough of how to use your Instant Pot. It’s said that the Instant Pot DUO60 is simple to wash and – as a stainless steel cooking pot is dishwasher protected. There is a lid peace on the pot, something that has been appreciated by several reviewers. One problem we found when it comes to ease of use came from J. Kenji López-Alt of Serious Eats. He said that the interface of the cooker wasn’t intuitive enough because of all the buttons and preset options. He also noted it’s hard to tell if the cooker is doing what it has been programmed to do because of the poor LCD feedback. He recommends being patient with the device and waiting for the small beep that lets you know cooking has begun. There were very few complaints on this front. The 6-quart version of the Instant Pot DUO60 was released in 2014, and there have been very few complaints about durability or the appliance breaking since then, even when people use it several times a week. The inner pot is made from a 3-ply food-grade stainless steel interior; something that is unique to electronic pressure cookers as most of them is covered with non-stick materials, a deal-breaker for those looking to avoid chemical coatings. There is one problem that we did see; some reviewers, even people who gave the cooker a 5-star rating, noted that the gasket smells after making something with a strong flavor, and it can be difficult to get rid of the smell. Some said they had to buy another gasket, the Instant Pot Sealing Ring, to have one for regular meals and one for flavored items. The gasket isn’t covered under the 1-year warranty. We’ve tested several multi-cookers for the past three months. All different kinds of foods were pressure cooked, such as white rice, beef chili & pork rubs w/ dried beans, sliced onions, beef stew and chili, and broccoli & carrots. When the cooking was finished, we had testers try a sample of each food dish. They were analyzing the dishes for their tenderness and overall taste. In addition, we analyzed how easy it was to use the pressure cookers and how clear their touch-based controls were to use for programming them. Even the coating on the inside of the pots was looked at for their level of durability. We found the Instant Pot to be an affordable and beloved device that allows for cooking all manner of things. Just don’t let yourself get carried away and assume it can replace everything in your kitchen, though maybe it could replace the oven if it’s too hot for cooking. If you’re after something that cooks more accurately, there’s also the Instant Pot Ultra. The Ultra model gives better temperature control. 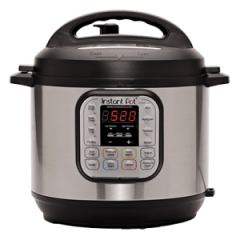 There are several other multi-cookers out there too but for the bang for the buck you can’t go wrong with the Instant Pot Duo60 model. Thanks to the stainless-steel exterior and bowl, the Instant Pot makes for a sturdy countertop appliance that is sure to last you for several years. Overall, the Instant Pot is worth the investment. When you want to cook a recipe, you need to prepare the ingredients properly or else it won’t come out right. Don’t just think of the Instant Pot as an appliance that cooks food. The Instant Pot oversees 90% of the total cooking by breaking down the ingredients for you. But it is the spices and mixing that really determine how well the recipe is cooked. Only a person can make these decisions. Instant Pot gives you convenience, though, because of its automated features. You don’t need to worry about building pressure and releasing pressure because it does this for you. Preparing meals for an entire family has never been easier. As a multi-purpose pressure cooker, the Instant Pot replaces your normal cookers, pots, and pans. Not only that, but it is very easy to clean, take apart, and put back together again. You can even find Instant Pots of various sizes and specifications. Electric cookers like the Instant Pot are very safe to use. There is virtually little chance of them blowing up like classic pressure cookers. Their electrical technology allows them to automatically shut off if they detect that the pressure is too high. However, building and releasing pressure takes longer than it does with a stovetop pressure cooker. But if safety is more important to you, than the Instant Pot is a better choice. It’ll keep you informed on its cooking status by making beeping sounds. Best of all, the Instant Pot can help you save up to 80% of the normal energy you would have consumed using another pressure cooker. This makes it environmentally friendly too. And if you have frozen food, you can put it directly in the Instant Pot without defrosting it first. Think about how much time and aggravation this will save you. Approximately three years later, what I’ve learned. I use this for everything! I have no idea how I live without this before? 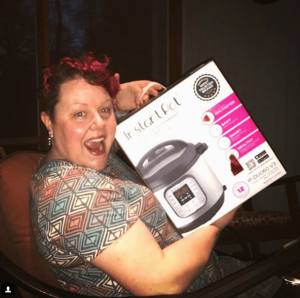 I’ve had my Instant Pot going on three years; I purchased it on Black Friday 2014. I am still as excited about it, still utilizing the heck out of it. I make a cake every weekend! Things have gotten to the point that my spouse says, “I don’t want to cook tonight. I simply pull out my Instant Pot and make dinner. My mistake for becoming skilled with the use of the Instant Pots. Just had to buy a stainless liner pot for it in case I have extra food to put in the refrigerator. My wife kept telling me we should get this. For months I opposed. We had a crock pot, so why pursue another gadget? We eventually got this on sale on Black Friday, and I Adore it. More agile than a crockpot and better results. You can season your protein and cook it with veggies. Man, Instant Pot gets a lot of free advertising LOL. You can’t argue with the kind of reviews this thing gets. It’s unmistakably for a reason!! Appreciate Instant Pot, for protecting my kids filled with fast food and microwaved process foods! Personally, I think they manual overestimates cooking times for greens. If I use their suggested cooking times, a lot of times they turn to slush. For example, My ideal personal setting to gently steam broccoli crowns is to use the “Steam” setting, set the timer to “0”, then release pressure as soon as it’s completed. This provides perfect broccoli that keeps the flowers intact, and the stalks a delightful texture. This same setting goes well for fresh cauliflower florets, retaining a nice firm texture but getting away the of the raw cauliflower. Fuse stopped working after the warranty. No replaceable fuse!! So, I enjoyed using my previously purchased Instant Pot, but it stopped working after three years. The company informed me it appeared like a blown a fuse. Unluckily, they use a proprietary screw to reach the fuse, and I would not be capable of changing it myself. Hence, they suggested I buy a new Instant Pot. To make the original purchase less severe, the company’s agent said she would email me an invoice to my email address with price discount. I never received the invoice. Representative told me to check my junk folder. The suspicious thing is that the customer service agent could send me emails of are a conversation. But, when she claimed she would send me an email with the discount, it would never make it to my inbox. I assume she was experimenting my patience (and she succeeded). I ended up spending full price for a brand-new Instant Pot. This is not your grandmother's pressure cooker! I am the worst chef in history. My poor children, it’s so sad I have a law, if I can’t eat it, we order out. Which results quite a lot at my house. Till I got this fantastic Instant Pot invention! I’ve had it for about four weeks now, and all I can say is a fantastic gadget! Why am I just now discovering about this? When I did cook, one of the best meals I used to make was sweet chicken, it would take me 2 hours or more, and I’d have 100 dishes to wash after cooking. So I discontinued making it. Overall, I am BEYOND satisfied with my investment and I am thrilled to share that dinner is a little more convenient at my house thanks to the IP! Size DOES matter... and this small cooker is the ruler in my kitchen! I admire my Instant Pot! After seeing several infomercials about electric pressure cookers, I did some investigation. 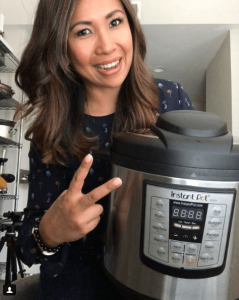 This Instant Pot had the best reviews and overall consumer happiness ratings as well as being quite a bit less costly than the one I observed on TV! I have had my instant pot electric pressure cooker now for months, and I am completely in love! If you are browsing reviews trying to decide out if you should buy one or not here is my view after research and my trial and error! Why Instant pot over other manufacturers? What I found was that the Instant put is stainless steel on the interior. Plus not non-stick. You don’t have to suffer about cooking your food in chemicals or disturb about the nonstick coating dwindling down and into your food. I have substituted my rice cooker and egg cooker, and put my huge crock pot into a room. This thing prepares all those things and more. And, as a person, the size of the Mini is excellent. The stainless steel pot is so much simpler to wash than my crock pot, both in the sink and the dishwasher. Don’t debate to contact support! I have total confidence in this device, because of their loyalty to the excellent customer experience. I love this Pressure Cooker! I can’t believe that I love my Instant Pot. All my friends were getting them and babbling about it. But I dislike my slow cooker, and I thought this device would be much the same. I ultimately decided to get one when my friend posted that she had made fantastic carnitas in it. My husband is Mexican, and carnitas are his beloved food so I finally decided to purchase it. It’s an all-around hero and clean up fast and simple.